Above: Sennett students read choice texts, which are in every middle school classroom across the district (each classroom received 4 copies of 30 titles). As part of the strategic framework, Literacy purchased the core reading materials - core instructional anthologies and choice texts. As you know, the Board recently approved placing a referendum to exceed our revenue limit on this November’s ballot. In this edition, you'll learn about two opportunities coming up in October where you can learn more and ask any questions you may have about the referendum. If you aren't able to attend in person, we'll also be live streaming the meetings on Facebook. Learn more below and find additional information about the referendum at www.mmsd.org/referendum. Questions about the referendum? Here are two upcoming opportunities to learn more. The Madison Board of Education voted to put a referendum on the November 8 ballot asking taxpayers for approval to raise the school district’s revenue limit authority by $26 million over 4 years. It would mean a $3 increase in property taxes per month for the average homeowner. We are holding two information sessions for those wishing to learn more and ask questions. Doors open at 5:30 pm, with Superintendent Cheatham presenting at 6:30 pm, followed by a Q&A with Assistant Superintendent of Business Services Michael Barry. We will be live streaming the meetings on Facebook. Go to facebook.com/MadisonWISchools to watch and take part in the discussion. Those needing interpretation or childcare are asked to RSVP at least 10 days before the event to 608-663-1879 or referendum@madison.k12.wi.us. You can find a complete list of Principal Partners on the Foundation for Madison's Public Schools website. Earlier this week your principal learned who will be serving as the Principal Partners at your school. Given the tremendous response this year, most schools are hosting more than one Principal Partner. Thank you! A Principal Experience activities will begin the morning of October 11, and principals and their partners will go to the Alliant Energy Center for lunch and a facilitated program that concludes in the early afternoon. 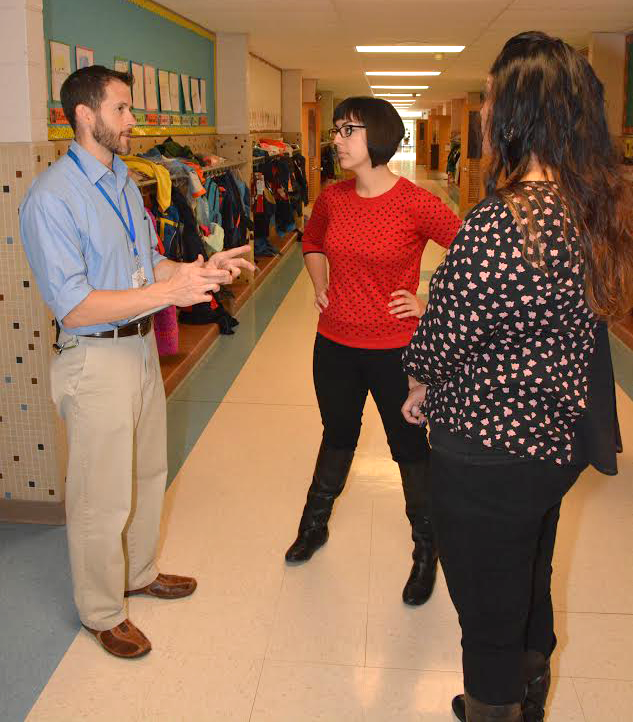 Above: Nuestro Mundo Community School Principal Josh Forehand with his 2015 Principal Partners Leslie Orrantia and Mayra Medrano. This past summer, nearly 200 of our MMSD teachers and staff participated in mindfulness courses and events intended to enhance personal well-being. Feedback was highly positive, and additional District-wide offerings are planned. Enrollment is now open on the MMSD PD Portal for a Day of Mindfulness on November 19; and a 10-hour Developing a Personal Mindfulness Practice course beginning November 28. Check out the September edition of the MMSD employee wellness newsletter Live Well, Work Well! Topics include Mindfulness in MMSD, wellness assessments, benefits of green tea, and a healthy recipe for summer squash. The MMSD Employee Wellness Committee is excited to announce the fall wellness campaign. The campaign titled, “The 30 Day Challenge,” is an individual challenge that all employees can participate in. The program will run from Oct. 17 through Nov. 15, with sign-ups due by Oct. 12. Starting on Friday, Oct. 7, Home Health United will be coming to certain MMSD locations to administer the flu shot. There should be a schedule of dates/times posted at your location/school, and you can also access it below. If you have any questions, please call 663-8437. To avoid a cost, please bring your insurance card. Note: Spouses and children are not eligible to receive flu shots. October is National Farm to School Month: What's Happening at MMSD? October is National Farm to School Month and there is a lot to celebrate in Madison. REAP Food Group’s Farm to School program is entering its 13th year. This school year the program will be serving local fruit and vegetable snacks each week to more than 5,000 students in 13 schools with a higher number of students from low-income households, teaching nutrition and agricultural concepts so students understand where their food comes from and how it was grown, providing hands-on culinary training, and transforming school lunch with garden bars at 32 elementary, middle and high schools. REAP and MMSD Food & Nutrition plan to increase local fruits and vegetables served from 50,000 pounds in 2015-16 to 100,000 pounds in 2016-17. Pay Check questions? We have answers! Two new, easy-to-navigate Google Sites have been created to walk you through understanding your MMSD pay check. See information for Monthly paid employees and Biweekly paid employees. Shout out to Tricia Crowley, PBIS Coach at Falk! Here are additional updates and announcements from departments and schools, published on Staff eNews. Shorewood’s student-led Ally Team turns 4! See photos. The latest installation of the hit new series 'Kennedy Carpool Karaoke' finds Kennedy's Social Worker Ms Bridget, 3rd grade teacher Mrs. Foshay, and REACH teacher Mrs Saeger on their way to Kennedy's Open House and Book Fair. If someone made a movie about our family, what would it be called? Can you talk about a difficult time in our family, and how we got through it? What is something about our family you feel thankful for? In our "Family Strengths" story booth, stopping at schools throughout Madison, families asked and answered questions like these and reflected on what makes their family strong. Here's a preview of just a few of their stories. Middle and high school staff: Due to the conflict between the progress report grading window and an issue with Infinite Campus, the grading window deadline has been extended until 11:59pm on Tuesday, Oct. 4. Oct 5. is International Walk/Bike to School Day. The Walk or Wheel (WOW) Challenge promotes safe walking and biking to school with a $250 prize for the two schools that are the most successful. You can take part in the WOW Challenge any week in October. REAP’s annual Pie Palooza is on October 30 - volunteers needed! The Student AODA Mini Grant Program supports student-planned projects to prevent alcohol and other drug abuse and related behaviors, and to promote the development of comprehensive school health-related projects. Application is due Oct. 16. Please visit this site for more information or contact Marcie Pfeifer-Soderbloom with questions. The first step in applying for a grant is to complete the Grant Inquiry Form.